Did you know? The Eat chain of restaurants sells fully-encased pies! Joyous, joyous news! I headed down to the Eat store in Camden Town, London, to see what delights were on offer. And here it is: a beef and ale pie. It set me back around £4.50 (I can't remember the exact price, I'm afraid...) - which for one take-away pie with no side orders is rather expensive. But at least this is a fully-encased pie, so that's a plus. The pie is of reasonable size and looks quite pretty in the box. 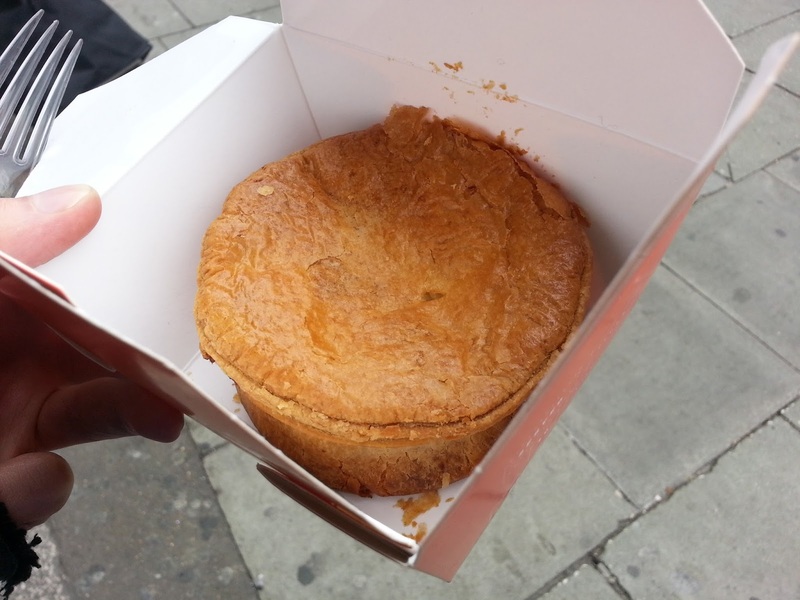 It has a nice golden colour to the lid, with a perfectly even colour across the whole of the top of the pie. There is no boil-out and the pie looks like it is in good condition. On opening up the pie, there is some airgap but overall this pie looks well filled. There's certainly a decent amount of meat in there - can't complain about that. The filling looks adequately moist with no need for any additional gravy. But it's when I try and cut all the way through the pie that I realise there's a problem. Why am I having such difficulty cutting through the base?? I flip the pie over and find the MAJOR issue with this pie. The base is so overbaked it is practically a solid, unbreakable, inedible block of pastry!! I tried to tear a bit of this base off so I could try and eat it - but there was no way I was going to be able to eat the whole of this base! This pie, for me, was a DNF (Did Not Finish)! In fairness to Eat, their customer service representative on Twitter seemed just as appalled as I was with the base of this pie. They have offered me a free replacement pie, which hopefully I'll cash in on soon (and report back on whether there's been any improvement on how they bake their pies in store). I'm sure this can't be a store-wide problem - otherwise Eat are doing this pie business all wrong. Let us know whether you've had any similar experiences with pies at Eat. The rest of the pie was actually quite pleasant, if you ignored the base. The filling was pretty flavourful, and the meat was tasty and not chewy. 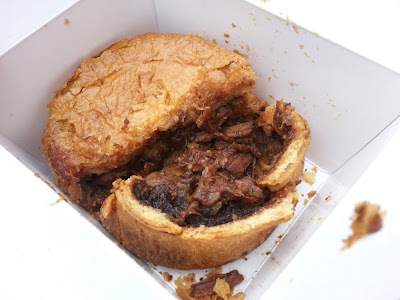 I can certainly see why this pie obtained a silver award at the British Pie Awards. 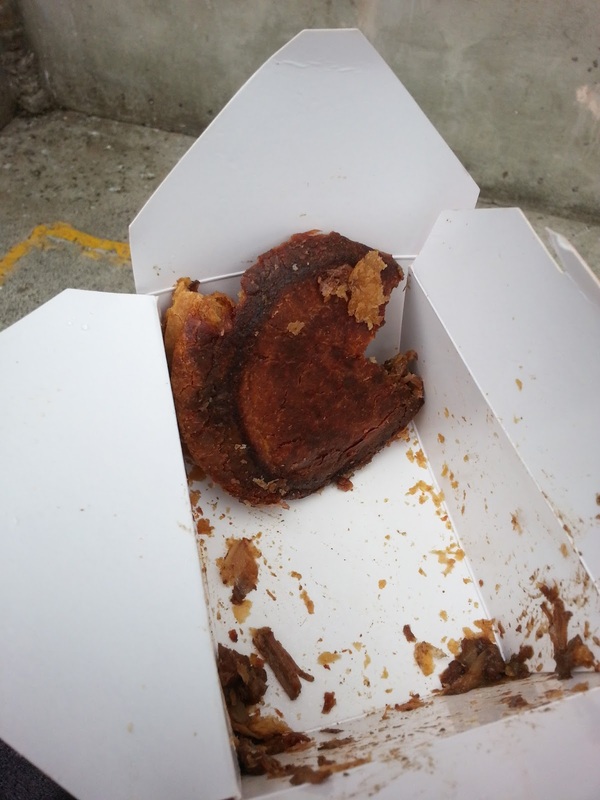 However, for nearly £5 for the pie, I think there are better hot takeaway pie options out there. Because of the issue with the base - and the resulting DNF - this pie is going to score rather lowly. You might think this seems a bit unfair (since this could be a one-off problem), but I have to rate the pie that's in front of me. In my opinion, I should never have been served this pie.